What are the important things to consider in NBA betting? Basketball is renowned for being one of the most fast-paced professional team sports. 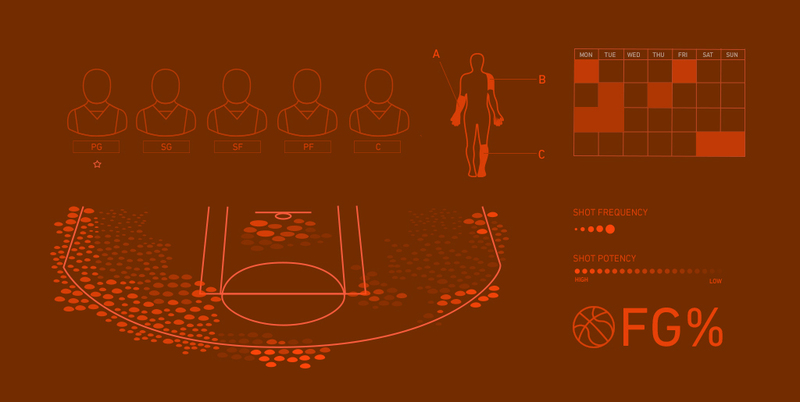 An end-to-end style of play and high scoring games make basketball exciting for both fans and bettors. The rules of the sport are fairly straightforward, while the betting markets range from the simple to more complex. The NBA is considered to be the elite of professional basketball around the world, but the rules of basketball are universal in all leagues (whether it’s club level Liga ACB and Greek Basketball League or international competitions like FIBA’s EuroBasket). Two teams of five players compete in a game of basketball on a 28.7m x 15.2m (NBA) or 28m x 15m (FIBA) court. The two teams try to outscore each other by dribbling and passing their way up the court to shoot (offence) and dispossessing their opponents or blocking scoring attempts (defence). Points are scored by shooting the ball through a hoop 46cm in diameter, raised 3.05m off the ground. Points come in the form of field goals (two points for scoring within the three-point line and three points for scoring outside the three-point line) or free throws (awarded after a rule violation and worth one point). A game is either split into halves or quarters – in the NBA it is 12-minute quarters. Unlike soccer, games cannot end in a draw and OT (overtime) will be used to determine a winner. The NBA consists of 30 teams split into the East and West conference with three divisions in each. Teams play 82 games throughout the regular season (an equal split of home and away). The eight teams with the best win-loss record in each conference progress to the knockout format playoffs with the winner of the final winning the NBA Championship. The Money Line in NBA betting is the same as the Money Line in NFL betting and baseball betting – the sports may be different but it is just a bet on who will win the game. Handicap betting in basketball is slightly more advanced than Money Line betting as teams are given a positive or negative point handicap to counter the perceived difference in ability. This means if a team is a heavy favourite they will have a negative handicap to overcome, while the underdog will have a positive handicap that acts as a head start. It doesn’t matter which team wins the game when it comes to Totals in NBA betting – it is simply betting on whether the total number of points scored by both sides will be over or under a figure set by the bookmaker. While the majority of bet types apply to what happens throughout the game as a whole, some markets focus on the outcome of an individual quarter, the first half or even the season as a whole. In addition to betting on the more basic markets mentioned above, bettors can also choose to bet on the first quarter or first half of an NBA game. The options – Money Line, Handicap and Totals – are the same but the time period for which the bet relates to is just reduced. If a team starts quickly but then tails off towards the end of the game, betting on them to win the first quarter or first half might make sense. Similarly, if both teams tend to rack up points early on, a bet on the over for first quarter or first half totals might be a popular choice. Betting on individual games leaves little margin for error and instances of randomness and luck will likely influence the result. Outright markets, however, are bets that typically cover a longer period of time – this could be the 82-game regular season in the NBA or even longer. Experienced bettors will know that betting isn’t about finding an in-form team coming up against a team that has struggled to win of late because it should be a “sure thing.” There are various factors that should be considered in every sport, before converting odds into probability, compare it to the available odds and only bet when you have positive expected value. Experienced basketball bettors will know there are various factors that should be considered in order to help get an edge in NBA betting. Due to the speed and intensity at which games are played and sheer volume of games in a season, injuries frequently occur and squad rotation is common practice in the NBA. Due to the fact that teams will often change their starting lineup and sometimes rest their star players ahead of big games, reacting to team news and injury updates is one way to get an edge in NBA betting. Sometimes social media platforms like Twitter can prove to be a useful source of this kind of information. If an integral player misses a game (be it the coach’s decision or enforced through injury) the odds for that team’s opponent winning the game could dramatically change. If bettors are the first to react to this, they will benefit from higher odds and be rewarded with more potential profit. While all teams play the same number of games in the regular season (and play each team at least once), the NBA has an asymmetrical structure that means individual team schedules can vary greatly in terms of the strength of opponent. 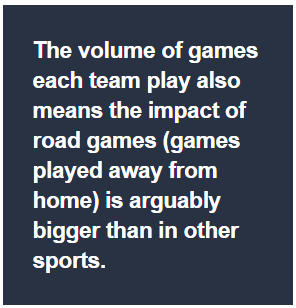 The volume of games each team play also means the impact of road games (games played away from home) is arguably bigger than in other sport. 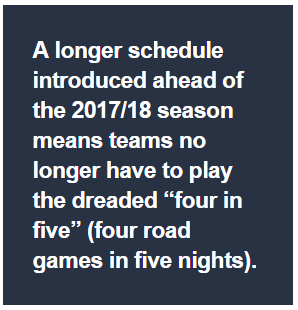 A longer schedule introduced ahead of the 2017/18 season means teams no longer have to play the dreaded “four in five” (four road games in five nights) but can still play four road games in a row, all in different time zones. Fatigue and lack of sleep are more prevalent when it comes to home advantage in NBA betting – if a team is at home and playing a team at the end of an arduous four road game stretch, their chances of winning will differ greatly to if they had come up against that team at the start of their road game stretch. As with any sport, analysing statistics will improve your knowledge and can help bettors make more informed decisions when it comes to NBA betting. There is a wealth of team and player performance data available, as well as betting specific statistics that will benefit bettors. Teams’ ATS (against the spread) record will show how often they have beaten the handicap mark set by the bookmaker. Over/Under records can be used to analyse how often teams have featured in games that have been over or under the totals figure. Bettors can also look at how often teams win or lose when they are the favourite or underdog and track odds movement ahead of individual games to try and identify betting patterns. Stats like these can also be used to assess how accurate the bookmaker’s estimation of each team’s performance is. Points in the paint – points scored within the key or from the free throw line – is an important team performance statistic as it is the most efficient way to score in basketball. 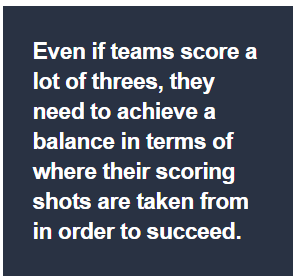 Even if teams score a lot of threes, they need to achieve a balance in terms of where their scoring shots are taken from in order to succeed. If a team has an above average ratio of three-pointers compared to points in the paint, bettors should look at how efficient the opponent is at defending against three-point shooters. This is just one example of something that will help identify teams’ strengths and weaknesses, find unbalanced matchups and take advantage of discrepancies in the bookmakers’ odds in NBA betting.